I hope the Bunny the was good to you and there was lots of family time! 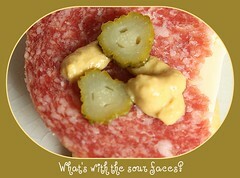 Whilst snacking on some Cervelat salami and cheddar cheese. I saw my food looking back at me. One little guy seems to have accepted his fate, while his friend seems a little more concerned about being consumed! There’s something soothing about making a cup of tea. Filling the kettle, selecting a mug, choosing a tea from my over stocked tea shelf and putting the elements together. I’m more of a one cup at a time instead of a whole pot kind of girl. If I go for a second cup, I’ll switch to another tea. I’m fickle like that and vari-ah-tea is the spice of life! 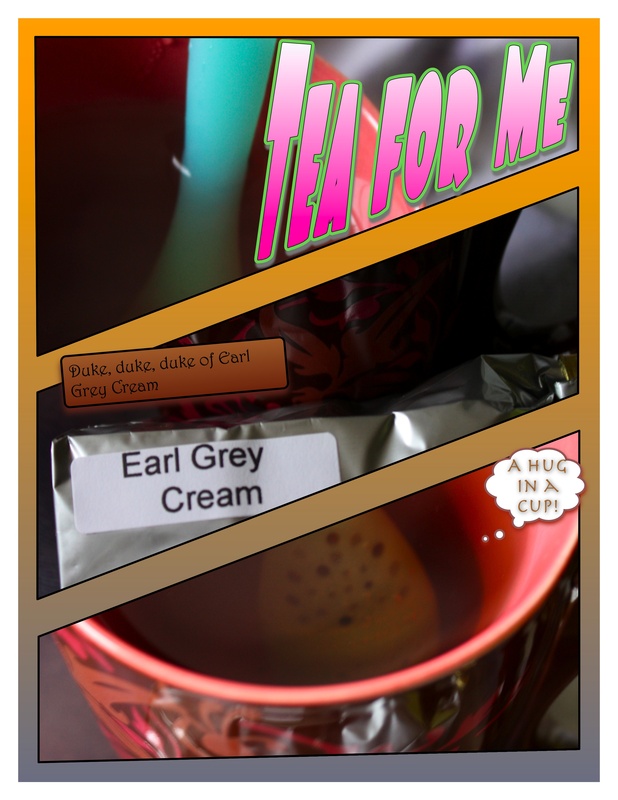 My first choice lately is Earl Grey Cream, a gift from my friend Banquette, it came with the mug pictured as well. The silicone tea infuser/stirrer was a present from Exec Chef and it is handy-dandy and aquamarine, two very good traits to have. I think what I like most about a cup of tea is that you have to pause the chaos of your day, sit down, inhale the aroma and take the time to sip. At work, fixing a cup of tea is an island of sanity in a sea of crazy. In the summertime, I make glass after glass of iced tea. The convenience of a hot water selection on the coffee maker and a freezer full of fresh ice cubes makes it a snap. But, takes long enough for me to catch my breath and recharge my batteries. Here’s to the restorative powers of a nice cuppa! Lord knows I’ll need more than a few to get me through this year. My darling Executive Chef husband was showing off some of the photos above to his restaurant team to taunt them with his weekend brunches at home. There is nothing like being woken up by the blissful smell of bacon goodness and heavenly hash browns, or so I’ve been told. I’m the one making the aromas come to life, cartoons blaring in the background. Not to be immodest (since my modesty is one of my best qualities), but I make a pretty damn fine brunch. The last time I had a good brunch at a restaurant, I told the cook responsible that his hash browns were almost as good as mine. As he tried to compute the comment, Exec Chef helped him along by acknowledging that this was highly complimentary. While my brunch menu always has bacon and hash browns on it, the third partner is a rotating one. Waffles, pancakes and French Toast take their turns on the dance floor. When I had my sourdough starter, pancakes had priority on the rotation. 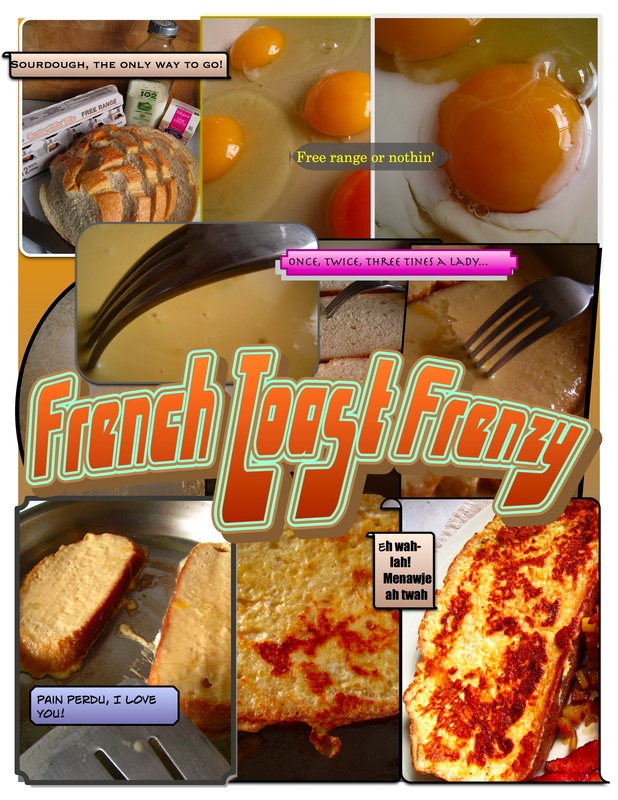 But, lately the boys are asking for the French Toast. Can I blame them? No, I can’t. It’s pretty darn good. The key is the bread. I will only use sourdough. I usually pick up a loaf from Save-On-Foods since I have yet to find a decent bakery nearby. I usually only use half a loaf for Frenchies, so I use the rest for croutons or freeze the remaining slices to use on another Sunday morning. My deep freeze is like a treasure chest, just colder and with less dubloons. My preferred topping is the darkest maple syrup I can find. Once, I had a bottle of this amazing maple syrup that is aged in a former bourbon barrel. I tried to make it last, but it was too good to resist. Exec Chef, on the other hand has only salt and pepper on his, albeit only kosher salt and freshly ground pepper. Junior Chef has been known to create a snowscape with powdered sugar and then ask for maple syrup on top! Do you love garlic? Because I do. It’s pretty dang amazing. I send my regrets to anyone who has an allergy to garlic. My condolences. I don’t know what I would do, besides pout a lot. I grew up with my mother worshiping garlic on a daily basis, it could cure anything and often did. Her theory was that if the whole family ate garlic then garlic breath wouldn’t be a problem. She did tend to overdo it with the raw garlic sometimes. But, man, if you complained that you had a cold coming on, she’d dose you up good and the sniffles would disappear. She would actually eat multiple cloves of raw garlic on toast with a bit of olive oil. Yeah, I’d just blow her a goodnight kiss from across the room to be safe. Roasted garlic is a thing of beauty, and a sweet mellow way to enjoy Allium Sativum (that’s MR. Garlic to you). But today, I want to introduce you to TOASTED garlic. 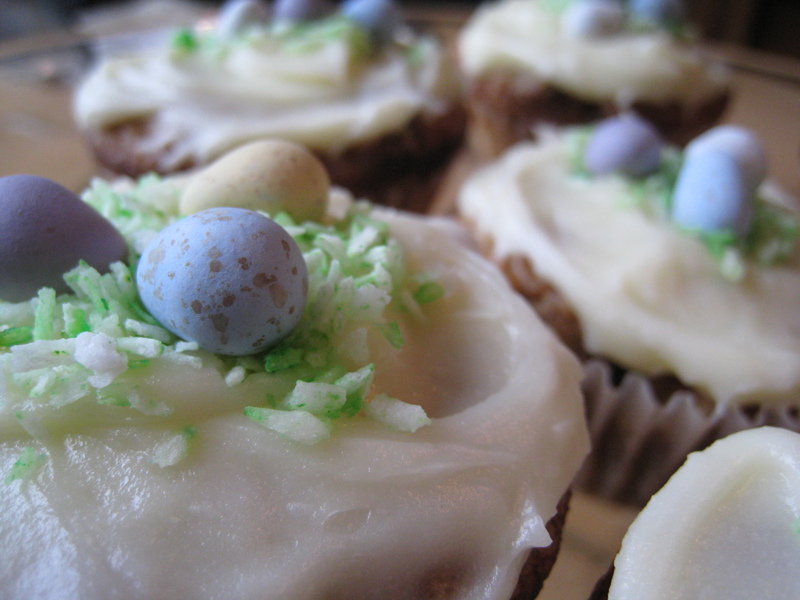 It’s half way between the spark of raw and the lush sugar of roasted. It’s a quick and easy way to take the bite out of the beast. Separate the cloves, but leave the skin on, toss them in a hot dry pan and shake them around until there are touches of black on every side. Let them cool down a bit, then skin and dice the cloves. This can be used as a substitute for raw garlic in any recipe where you want to tone down the garlickiness or a sub for roasted garlic if you don’t have an extra 45 minutes. One of the fastest ways to enjoy the toasty loveliness is to mix it up with some softened unsalted butter, freshly grated parmesan cheese and salt to taste. Slather it on the crustiest bread you can find, give it a fresh grind of black pepper and slide it under the broiler for about 10 minutes until it is golden and bubbly. The best dance partner for this crusty loaf is a saucy tomato of a dish like spaghetti and meatballs, or chicken with a tomato pesto sauce on polenta. Dang, shouldn’t write this on an empty stomach. Good thing I’m making some tomorrow to go with lasagna!